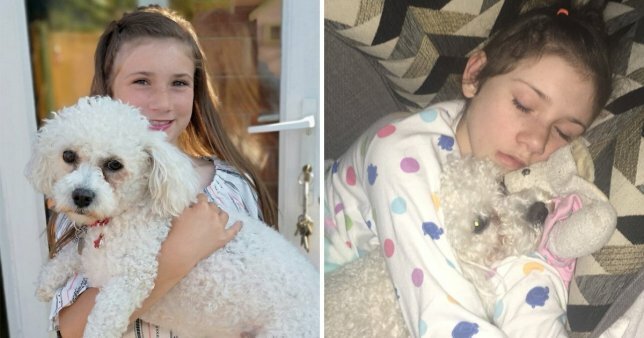 A girl with epilepsy has forged a life-saving bond with her ‘best friend’ – a pet dog who can predict the onset of a seizure. Millie Webb, 11, has refractory epilepsy and can suffer more than 100 seizures a day. She has a ‘unique’ form of the condition as medication doesn’t seem to help control the seizures which can be triggered by her own laughter. If she is left alone, a fit could be fatal, as a seizure could result in a serious brain injury or cause her to choke on her own saliva. Playing with friends, attending birthday parties and even splashing about in the family paddling pool have all triggered fits in the past. She has now forged a bond with pet dog Elmo who it’s claimed is able to predict the onset of a fit before it happens. The three-year-old Bichon Frise is now learning how to be a potentially life-saving companion for Millie through the Good Citizen dog training scheme. She is in training to register as a service dog and once it’s completed Elmo will be able to attend school with his best friend. Elmo already licks saliva off Millie’s face, barks to alert her parents when she is having a seizure and will be eventually taught to fetch medicine. The pet dog once ran to the rescue Millie, from Warrington, Cheshire., when she suffered an attack in a swimming pool and dragged her out. Elmo currently has a service dog vest which allows her to accompany Millie into shops and restaurants in case she has a seizure. Stuart Webb, Millie’s dad, has told how Elmo amazingly started to pick up on Millie’s seizures in 2016 without any training. He said: ‘Since they were young, they were both inseparable – like best friends. Elmo always follows Millie around and sits and cries when she goes out.